I always have admired wedding photos that feature beautiful wedding dresses hanging on lovely handmade wedding hangers… A photo, in my opinion that you must have in your wedding album! Today brides are paying attention to every single detail to make sure their wedding day is nothing short of perfect! Wedding hangers are just one of those lovely details. There are so many choices in bridal hangers for a bride today! From rustic wooden bridal hangers to the more romantic wedding hangers, they are choices for every wedding style. You are excited because you have finally found the perfect dress! But wait! You’re missing one thing that can play such a creative and cute role in your wedding… The must-have thing you’re missing is an ideal wedding dress hanger for your wonderful dress! 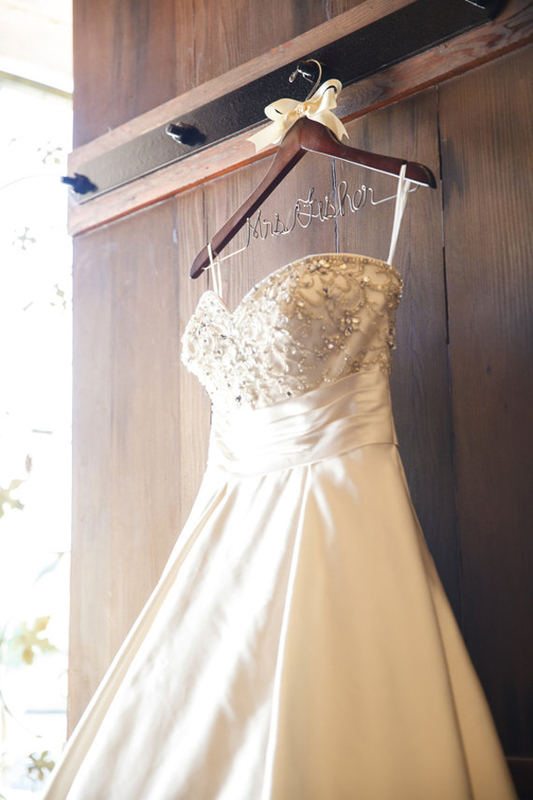 Your wedding dress is the main focus and photographers seek out to capture it in a perfect place. 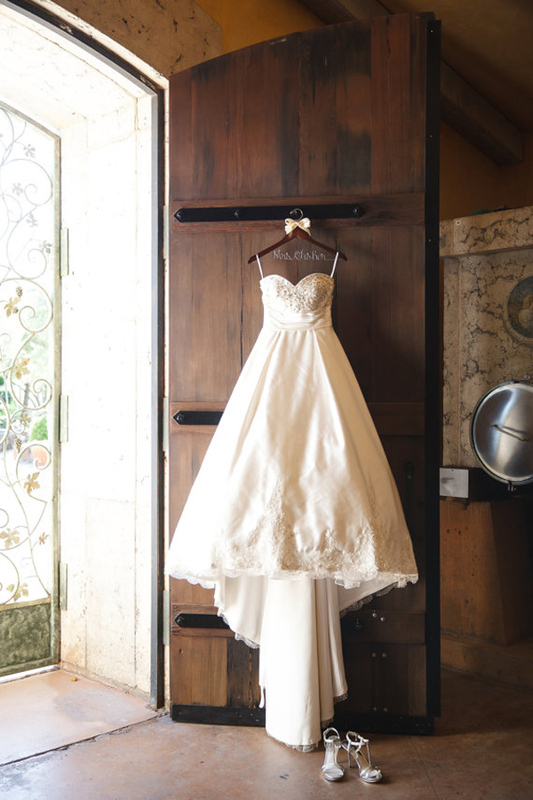 Imagine your wedding dress hanging from a beautiful and decorative hanger rather than a plastic, boring one. The result will be so much better! Take a few moments of your time today and check out this stylish and trendy collection of bridal hangers we discovered on Etsy. Personalized wedding hangers are always an awesome gift and a sweet detail that will make the moment and a photo prettier. 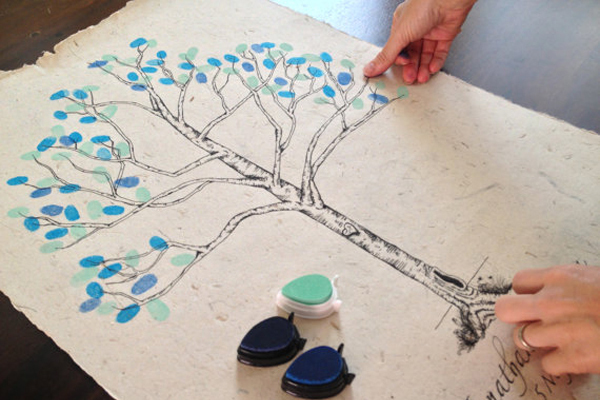 You can find a personalized hanger with hand-painting, engraving, wire art and decorative bows. 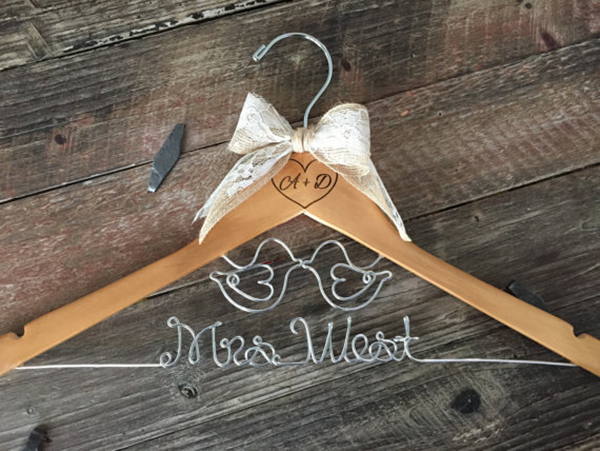 Loving this personalized wedding dress hanger with the ivory bow on top. 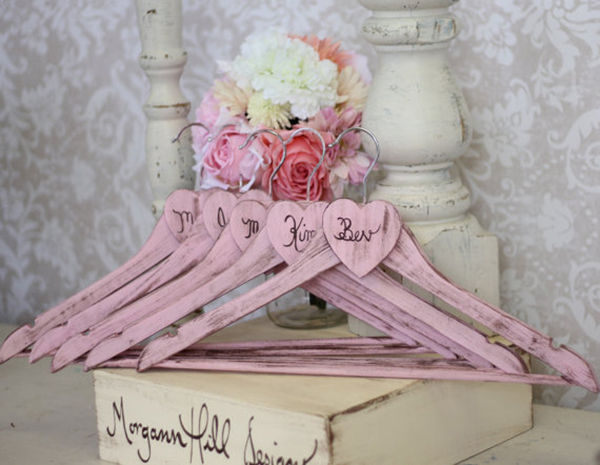 Bridal hangers can also be used as a great gift idea for your bridesmaids! You can choose to write only one word, your name or the date of your marriage. For decoration you can choose whatever you want! Bows, flowers, diamonds, pearls… Make the ideal choice according to your wedding style! Every bridal hanger can be a good memorial of your special day! 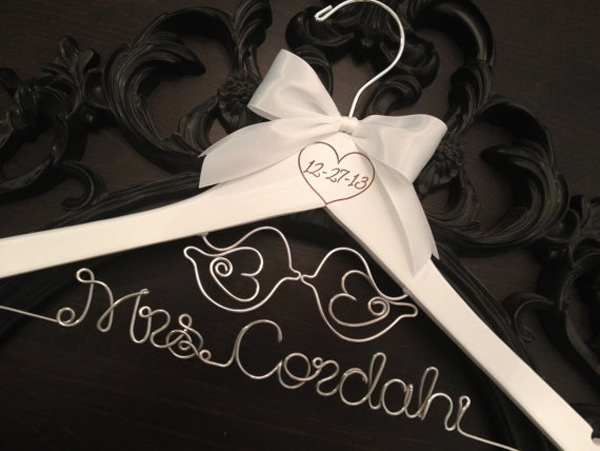 Personalized wedding hanger with wire love birds… the perfect symbol of love! 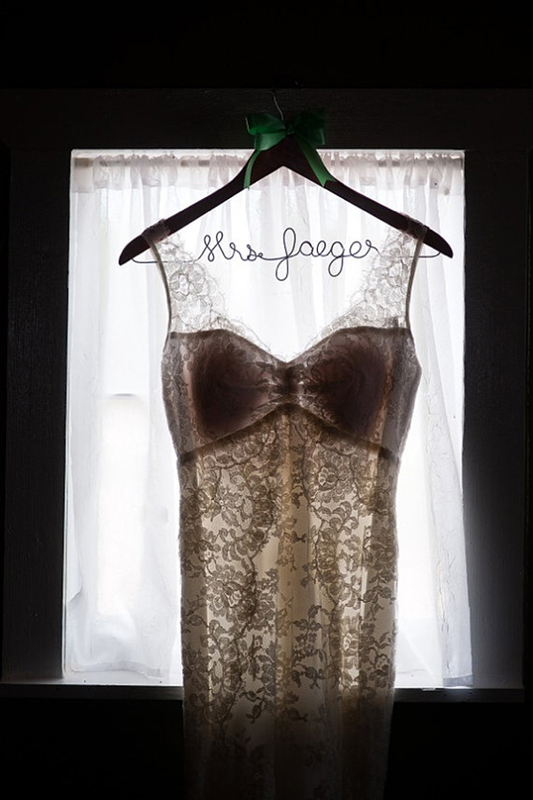 A great choice for the rustic or vintage loving brides! Add some color in your wedding bridal hanger that will match the main tone of your wedding decoration, by choosing a colorful bow, such as pink, navy blue, purple with a white hanger. Of course, except from birds you can choose your favorite animal or something symbolic for you and your husband. For example, cats, teddy bears, or even characters from Disney and comics! 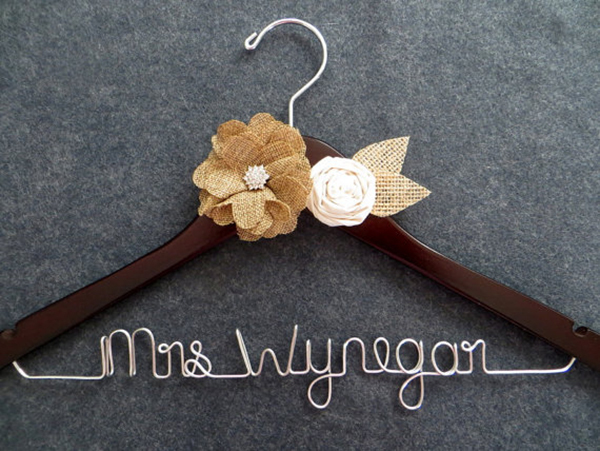 Wooden wedding hangers can also be an excellent idea for a gift for the bride on her wedding day. This white wooden bridal hanger featuring the love birds is adorable! 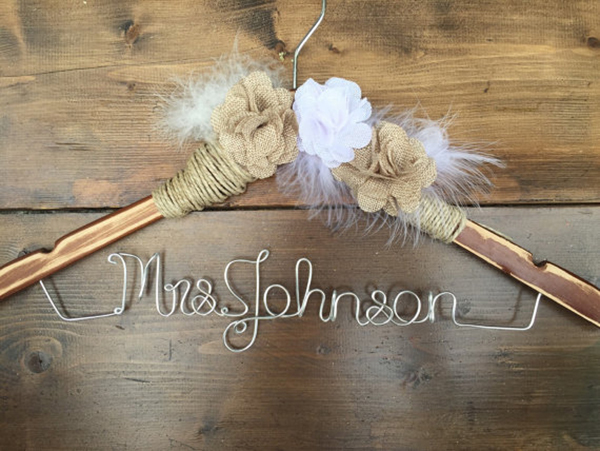 If you want to add a vintage touch, you can choose a wooden hanger in any color with engraved letters and birds! The color and type of wood is also a choice that you take into consideration. A dark brown wooden hanger can change the result completely! The wedding photo of the wedding dress on a stylish bridal hanger just before the bride puts the dress on for her wedding day! Such a must-taken photo that every photographer should capture. Remember to choose a nice background for this photo that will match with your wedding style. For instance, wooden background for a rustic wedding, glass background for an elegant wedding, white lace curtains or old-fashioned wardrobe for a vintage wedding, bloomed garden or flowers for a boho wedding or the deep blue sea and nature as a background for a simple, summer or island wedding. Think and create every single detail of your wedding and the result will enchant everyone! What to say about rustic style? It’s just LOVE! We’re obsessed with the mix of both modern and rustic, wooden details for a wedding so if you love it too, then enhance your wedding with different rustic touches. One of them is the bridal hanger of course! Personalized rustic bridal hangers that will match your rustic wedding theme: this wooden wedding hanger has a mahogany finish and an adorable heart detail made with rustic wire. Undoubtedly, a countryside wedding needs a rustic bridal hanger to complete the theme! The wedding photo of your wedding gown hanging so beautifully in the room when you are getting ready for your special day, is one of the signature photos in your wedding album. Make sure you choose the bridal hanger that will compliment your wedding theme. Either you are planning a country themed or rustic wedding… or a chic & minimal modern wedding… or even a shabby chic wedding , you can certainly find the perfect bridal hanger! Beautiful personalized bridal hanger in white with an elegant engraved hibiscus flower design with the bride and groom’s names, the wedding date and the new last name in silver wire. This is an ideal choice for a country themed or boho wedding because of the flowers and the vivid colors… I just love the coral ribbon! 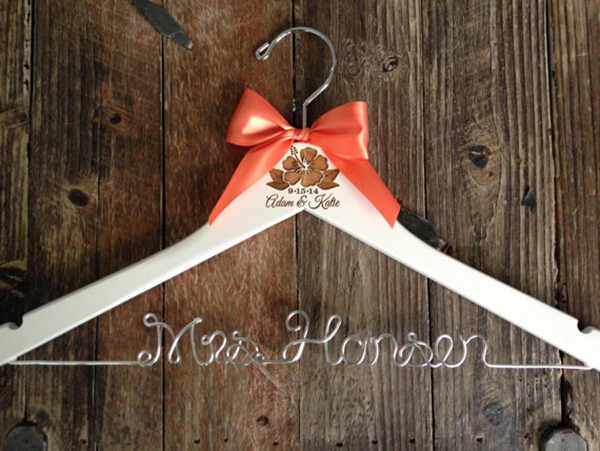 This personalized bridal hanger with burned / engraved wedding monogram makes the perfect addition to your wedding day dress photos! 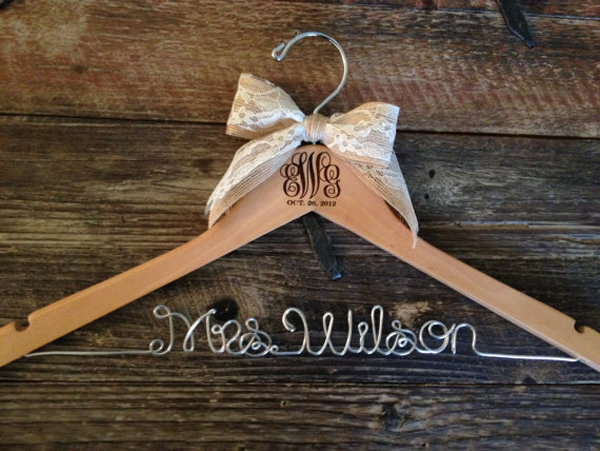 The style of the following hanger is clearly vintage or rustic because of the burlap – lace bow and the style of the monogram. 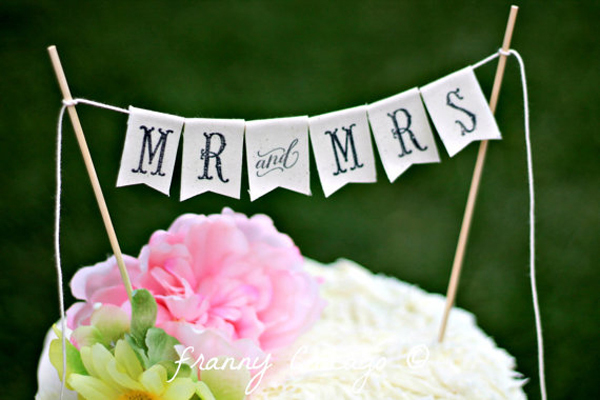 You can easily choose a different, more elegant font that will fit to your wedding style. Also, if you want some color, replace the beige bow with a pinky one! For a luxurious and chic wedding you’ll need an elegant bridal hanger! Choose a simple one or add some glamour with pearls that will make the difference! Diamonds and crystals will add shine and an aristocratic sense that everyone loves! Lovely single line bride hanger for the elegant bride with a pop of color! Bohemian style, also known as boho-chic means free-spirited. You can choose between colorful ribbons, flowers, macrame or bloomed garlands to decorate your own bridal hanger. If you are a bohemian soul, choose this beautiful style of wedding and pick color! Wooden bridal hangers always have a unique elegance with intense vintage element! If you want wood to be the main element of your wedding but not in classic brownish, beige or white color tones then choose a wooden piece in pink, baby blue, coral paint. A lovely pink wooden bridal hanger for the shabby chic bride… So romantic! And let’s not forget about our beach loving brides! 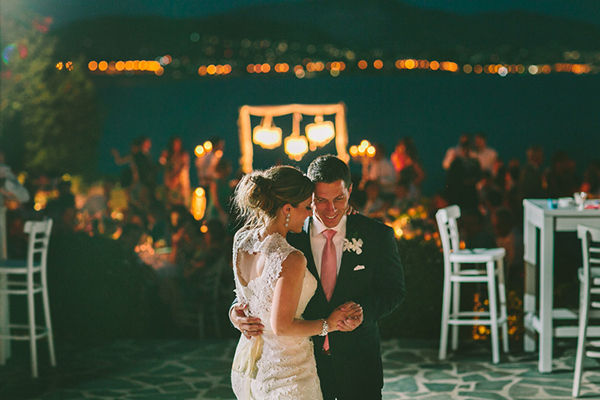 You decided that for your wedding you want a big, careless party on the beach with lots of fun, music and dance! Especially, if your summer wedding will be held in an island, this is the best choice you can make! From all the summer, beach details you can add, the bridal hanger will be the prettiest! A must-have for a Summer wedding in an island is a beach-themed wedding hanger. 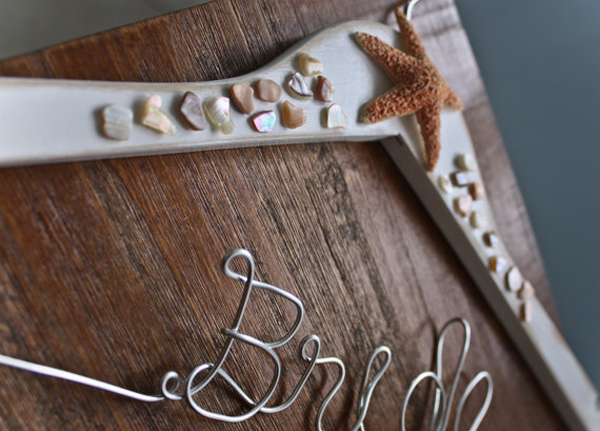 Bridal hangers with a white finish and decorated with beach themed details: starfish and rock accents! Now for the glitter-lovers out there, this option will be the best of them all! If you love sparkle, decorating your hanger with bright, gold or silver glitters is a must! 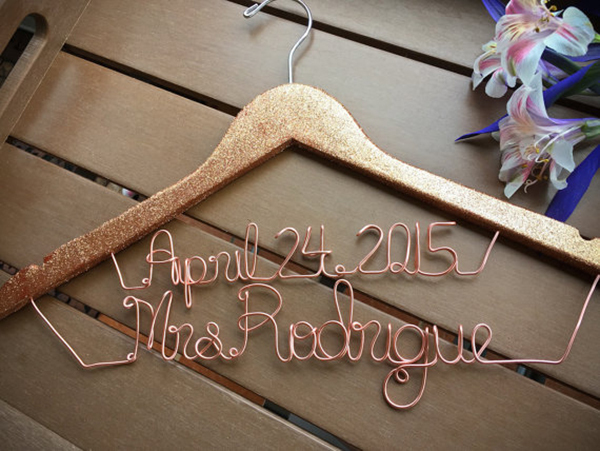 Check out this line glitter bridal hangers and get lost in their shine! Such a beautiful accessory for your wedding day! To sum up, bridal hangers are always a great idea to make your wedding a little more special and put a dose of cuteness! They’re a sweet touch that really stands out and complete a really gorgeous photo! They’re many options out there to choose and most of them are relatively inexpensive. So, you decide, according to your style and your preferences. If you’re a perfectionist like us, then you must know that the simple details make the difference! Make the difference by choosing a unique, bridal hanger according to your personality and your style!